The last few years have been tough for grocery stocks because of the competition from online stores. However, there is some positive trend in grocery stocks with rising wages and low unemployment. But with so many grocery stocks struggling, there have to be some stocks in this sector worth investing in, right? There are. Unfortunately the list is fairly short. 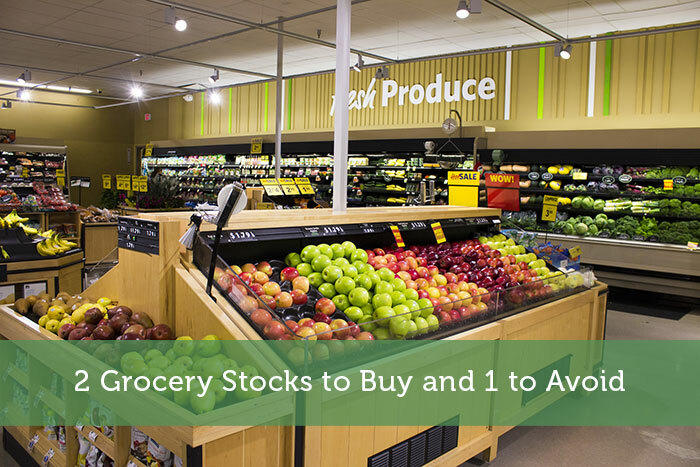 I’ll walk you through 2 grocery stocks to put on your radar or consider buying now. I will also highlight one popular grocer to avoid for the foreseeable future as they have hit some troubling times. Sprouts Farmers Market provides fresh, natural, and organic food products in the United States. The stock is currently trading at a price to sales ratio of 0.50, a significant to its industry peers. The company announced that 13 stores would be opened this year taking the total to 340 stores in 22 states. The management is taking various initiatives on product innovation and improving customer experience. Sprout farmers has also partnered with Instacart to provide same-day delivery to customers. The median analyst expected earnings per share is $1.34 for 2019 compared to $1.28 for 2018. Revenue is expected to increase 10% year-on-year to $5.72 billion. Kroger Co is available at an attractive forward P/E ratio of 10.03, a significant discount to its industry peers. The shares were under pressure recently due to the soft guidance for 2019. However, with the management’s focus to increase online sales and the low valuation the stock could once again be on the radar of value investors. The company has recently completed the sale of You Technology digital coupon subsidiary to e-commerce analytics firm Inmar for $565 million. As part of the transaction, the company would receive $400 million in cash which the company expects to pay down debt. For the fiscal year 2020, the median analyst’s earnings per share estimate is $2.21 when compared to this year’s EPS of $2.16. Revenue is expected to grow by 1.15% to $123.34 billion. Walmart’s last quarter results beat analyst’s median estimates and same-store sales rose 4.2% in the fourth quarter. However, the shares are slightly overvalued at the current price. The stock is trading at a P/E ratio of 41. The company would also continue to face completion from online retailers and new companies which are trying to grab the market share of Walmart. The company’s earnings would be under pressure in the next couple of years because of the Flipkart deal. Flipkart is also losing online market share in the Indian online market from Amazon.com. “We cannot ignore the facts that Flipkart will likely weigh on consolidated operating earnings for the next couple of years,” according to Raymond James analyst Budd Bugatch. The median analyst’s EPS estimate for the next year is $4.76 compared to $4.91 for the fiscal year 2019. Revenue is expected to grow by 2.89% to $529.3 billion. In all, grocery stocks are not a fun place to be as an investor. But if you can weed your way through the bad options out there, you can find a few diamonds in the rough. And when you do, make sure you hold on for the ride they are going to offer you.